Here are some of the most frequently asked questions of forumy and Julippy things. If anyone has any suggestions for more, let us know! Julip Horses have been in production since the 1940s, being made from chamois leather to begin with and then moving onto the latex with wired legs that we are used to now. They are roughly 1/12th scale (the same as most doll's house miniatures) and many different moulds and breeds have been made over the years. There are two distinct types; the 'Originals' - handmade from latex rubber with wired legs and the 'Horse of the Year' range, or 'HOTYs' - mass produced, non poseable models in rubbery plastic. What Julip moulds are still in production? Over time the plaster moulds break down and are either recast or are replaced by new sculptures. This means that many of the older moulds are no longer available to order. The ones below can still be ordered from Julip HQ and examples of them can be found -here-. How can I buy 'spares' through the forum? Purchasing Julips through the forum couldn’t be simpler; once you have spotted a Julip that has taken your fancy all you need to do is post a ‘buy’ comment below it, we will then contact you through a personal message to arrange payment and postage; unfortunately we are only able to accept payment through Paypal, personal cheque, postal orders or collection in person, with no card payment at this time. As the spares are sold on a ‘first come first served’ basis, so please only post within the thread if you are fully intending to go through with the purchase or the item has already been sold to avoid confusion. While the forum does have an attachment feature, most users find it far easier to use a hosting service such as -Photobucket- or -Tinypic- to post pictures from. If using Photobucket for example, once you have created an account and logged in, click on the big green 'Upload' button at the top to select the pictures you wish to use from your computer. They'll upload automatically and then, once on the site, you can copy and paste the following 'codes' to insert your images. Since I took this screenshot the look of photobucket has changed but the method remains the same. The second and fourth codes are the most useful for this forum - the other two can be safely ignored. The 'IMG' one will insert the actual image into your post while the first, the 'URL' will merely link to it instead. 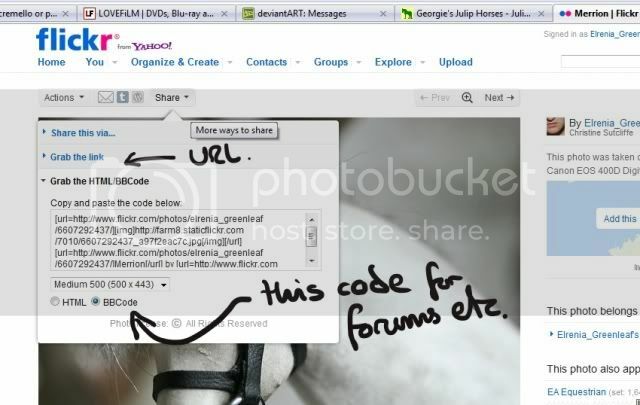 You can also use Flickr but just make sure that you use the BBCode rather than the HTML one. What are image hosting sites? These are websites that you can create accounts on and upload photos to. The website then becomes the storage area or 'host' for the images. By doing this, you can then use the codes given to directly link the photos and post them into your message as an image or alternatively (and often a good idea if you're posting a lot!) to provide clickable links to the images themselves. Avatars (the image on the left, under your forum name) can be a maximum of 200x200 pixels and signatures 500x200. Pictures that are too big and make the page stretch will be removed as no one likes to have a page overwhelmed by massive images after all! Most image editing software will have resizing options but if not, there are plenty of online resources that can do the job. Go to 'Profile' at the top of the page, then 'Edit Profile' on the right. You will automatically be on the 'Avatar' page, then you can upload an image to use either directly from your computer or by linking to one you have up on a host site such as Photobucket. How do I change forum skin? The forum has several different colour schemes, from the default green and black and others on the way. You can change to another skin by going to your profile at the top of the page, then clicking edit profile followed by settings then selecting your choice under Forum Themes. You can switch back to another theme at any time.